If you can imagine the short-lived Geena Davis vehicle Commander in Chief filtered through the grey lens of Scandinavian crime drama, that might be the easiest shorthand for Borgen. Like that American show, Borgen focuses on a woman thrust into the very topmost echelons of power – in this case centrist politician Birgitte Nyborg (Sidse Babett Knudsen from The Duke of Burgundy and Westworld), who finds herself unexpectedly designated Denmark’s first woman prime minister. But, as is the case with all the best series, that synopsis barely scratches the surface. Sidse Babett Knudsen as Birgitte Nyborg. He’s not wrong, but what’s remarkable is that Borgen came along at time when prestige television drama was at its peak. The current TV landscape is, if anything, overstuffed – with so many competing networks and streaming services, it’s difficult for any one series to distinguish itself, with only the big dogs like Game of Thrones, The Walking Dead and The Handmaid’s Tale being on everyone’s radar. Seven-odd years ago, the field was thinner, but giants bestrode it. Borgen’s contemporaries include not only long runners like GoT and TWD, but critical behemoths such as Breaking Bad, Mad Men, Homeland and Boardwalk Empire. It is remarkable that a dour drama, subtitled for English-speaking audiences, could find much of a foothold in that milieu. Unless you’ve seen it, of course, and then it all makes sense. Borgen is superb drama: mature, cynical, and complex, but anchored by well-drawn, goal-oriented characters that ensure you’re never lost at sea, even when the Machiavellian plotting and political horse-trading gets utterly labyrinthine. Chief among these is, of course, Knudsen’s Nyborg, who has to contend with the misogyny entrenched even in the leftiest of circles at every turn (true to the Danish political sphere of the time, the show deals with centre-left parties and rivalries – there’s no simple Dem/GOP or even ALP/LNP dichotomy here). Nyborg is a complex, driven, at times ruthless protagonist, although one who retains a spark of idealism no matter what political compromises she’s forced to make in the course of the show’s twisty drama. Two Game of Throne veterans show up in key supporting roles. Pilou Asbæk, recently seen in the WWII action horror Overlord, is Kasper Juul, a canny political advisor and spin doctor, while Birgitte Hjort Sørensen is Katrine Fønsmark, a TV anchor who becomes a vital political ally as the show progresses. Nyborg and Fønsmark are just two of many strong female characters, and Borgen impresses because it’s effortlessly, almost invisibly progressive, by dint of its very conceit and its setting in democratic socialist Denmark. Yet it still grapples with a number of hot button issues that are still in play today: immigration, health care, environmental crises, women’s rights, and more. That these play out in a multi-party parliament rather than a two-party field simply make the debates and the political duplicity all the more complex. 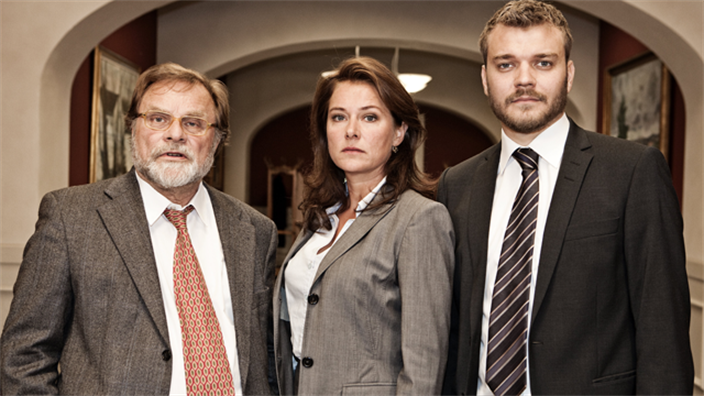 Borgen may lack the murderous, grand guignol inventiveness of Scandi crime, but its charms are more refined. This is an astute and thoroughly gripping drama that refuses to compromise on complexity, and anyone with a jones for politics should run to see it. Why are we so obsessed with flawed TV cops battling inner demons? Substance abuse, family issues... whatever they're haunted by, we can't get enough of it.